On Thursday, Jan. 11, 2018 the Manor College Alumni Association elected a new executive board at its regular business meeting. 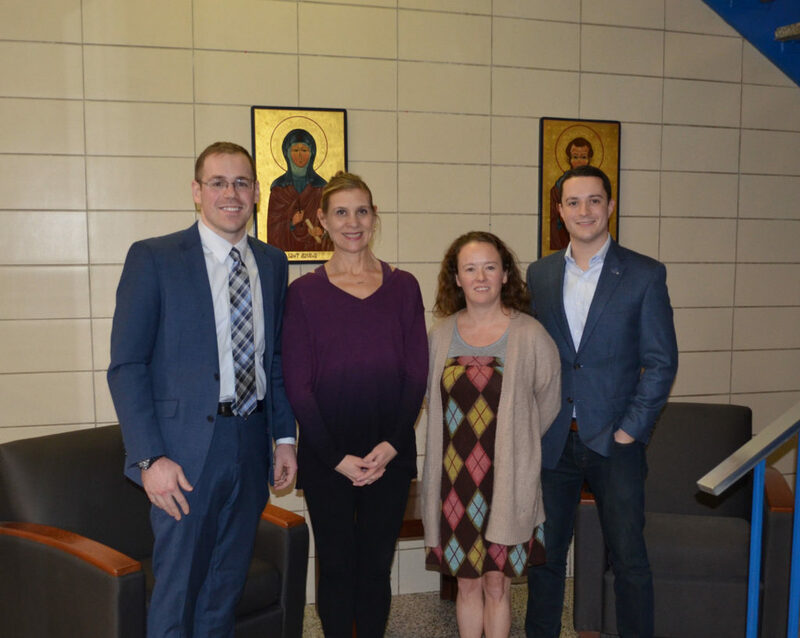 Those in attendance also officially adopted Alumni Association bylaws, effective immediately, formalizing the organization which began less than two years ago as a conversation between a Manor alumnus and the newly-arrived Manor College president, Jonathan Peri. Gillespie graduated from Manor College with an associate’s degree in accounting before continuing on to Saint Joseph’s University. He now works as a Pre-sales Solution Engineer at SAP. His term runs through June 2020. Vice President, Beverly Bisaccia (AH ’03) and Secretary, Mary Jo Bell (BSL ’15), have also been active participants since the start of the Alumni Association. Bisaccia is an Instructor and Education Coordinator at Manor College for the Veterinary Nursing programs, having returned to teach at Manor 10 years ago after starting her career in veterinary technology. Bisaccia is currently working towards a master’s degree at Villanova University. Her term will end June 2019. Bell, received her Paralegal Certificate from Manor College before continuing her studies at Temple University and works in the legal field. Bell’s term will end in June 2020. Treasurer, Trevor O’Neill (BSL ’13) graduated from Manor College with a degree in accounting. O’Neill spent time working in the accounting field before returning to school at La Salle University, where he is currently studying. According to O’Neill, it took him returning to school to really appreciate where he came from. Now he is looking to contribute and better serve the Alumni community at Manor College. O’Neill’s term will end in June 2019. The newly appointed executive board positions are effective immediately. Looking to get involved with the Manor College Alumni Association? Visit our website for more information on events, volunteer opportunities and more!